This is a wonderful park and bike path, inaugurated in 2008 as a gift from the government of Québec to the capital for its 400th anniversary. 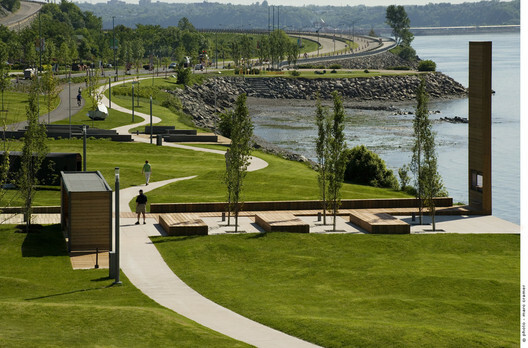 The park runs along Boulevard Champlain between the Pierre-Laporte bridge and Côte de Sillery, and the St. Lawrence River. It ends at the Quebec Aquarium. The park is an architectural gem and has won numerous awards. There are several sections, including a wooded section with paths, sports fields, and Station des Quais, which has four themed gardens. There’s a lovely cafe right on the water, at a little over the half way mark.